In the morning of March 1st, 2010, I made my second observation of „glorydescent clouds“ (here the first). These are fragments of a glory which change very much in diameter due to the different size of the droplets towards the rim of a short-lasting foehn cloud. This makes the sequence of the colours look asymmetrically. The stratocumulus lenticularis cloud did not even last for 5 minutes and caused a bright and very changeable iridescence or “glorydescence” during this short period of time. When the colours reached their maximum, up to 4 systems of rings were visible, with the 4th one appearing in the cloud behind the glory. The pictures were taken at 8.05 CET / 8.06 CET / 8.07 CET. Posted on May 27, 2011, in glory and spectre of Brocken and tagged glory, glory iridescence, Mt. Wendelstein. Bookmark the permalink. 3 Comments. Congratulations to Claudia for this impressive photo! It seems that “glorydescence” should be included in the atmospheric optics effects list, since iridescence and coronas are classified as different items as well. Two or three years ago, this effect was discussed only as hypothesis in the AKM forum, now there are several clear photos for evidence. Beautiful picture. I agree with Alex’s comments. I remember posting an antisolar iridescence picture somewhere a long time ago and suggesting we should include it in the list of atmospheric phenomena. Someone at the time suggested to me (sarcastically) that it is called a glory and I should read about it. In my opinion it is as separate a phenomenon from the glory as iridescence is from a corona, so it deserves its own name. 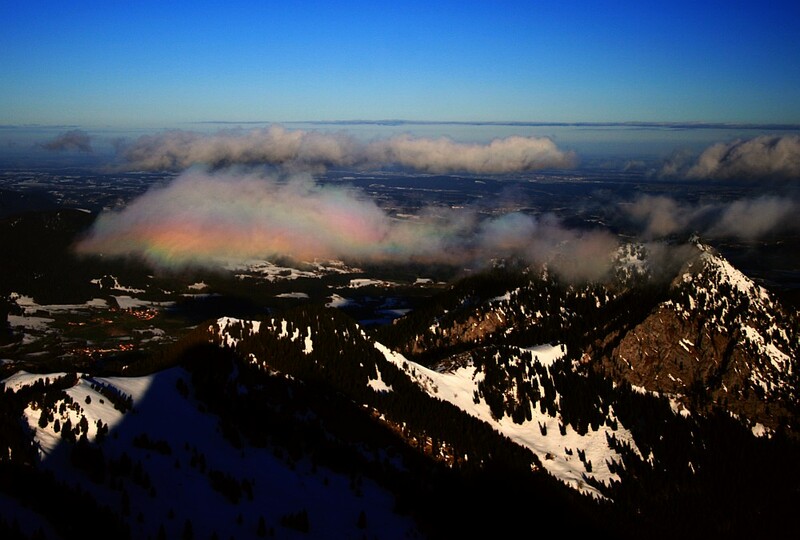 The antisolar iridescence can often be seen from airplanes and mountaintops, and although it is usually very subtle, it can stretch up to or more than 30 degrees away from the antisolar point.